The Yankees have a 1 in 10 chance of winning the World Series this year. Same as last year, and the year before. Same as next year. Roll a set of dice and hope you get a 5. Same odds. the luck of your top players being healthy and in a groove for each series in October. The luck of the ball bouncing the right way. The luck of a hitter hitting a pitch in a clutch spot and getting it all, vs hitting the ball one millimeter differently — a fly ball to the wall vs a homerun. Etc. The Yanks have a great lineup; excellent defense; good enough starting pitching, and a tremendous ballpen. Just like last year when they were outed in the second round, after winning the 1-game wildcard playoff game. And so bottom line I think the Yanks will win 100 games this year, and take the Division title over the Red Sox who will win 96 or so games. Picking numbers out of the air. And the playoffs — who knows? Roll the dice. Hope I’m wrong here but I have a feeling Luis Severino will not contribute much this year. He’s currently out due to soreness in his rotator cuff; due to miss the first few weeks of the season. Based on his horrible second half last year, I fear there is something up with his shoulder. Greg Bird will have a good year at the plate. Luke Voit will too. Yanks will at times put Voit in at DH and put Giancarlo Stanton in Left Field. This may become their regular lineup. Gleyber Torres will lead off. Today Aaron Boone announced the Yankees opening day starters — and with Aaron Hicks out injured, Brett Gardner will be in centerfield, Luke Voit will be the DH, and Greg Bird will be at 1st base. So far, the prediction is working out. C: Gary Sanchez — Has looked good so far in the Spring — has hit a few opposite-field doubles like he did his rookie year. He needs to continue to do that — hit to the opposite field not pull everything. 1B: Greg Bird — Predict he will have a good year. Yanks showing a lot of confidence in him. He has hit well in Spring training (as usual) and looked confident at the plate. We’ll see. 2B: Gleyber Torres — Expect a good year from Gleyber, adding to last year’s good rookie year. 3B: Miguel Andujar — Like the fact that Yanks kept him vs paying thru the nose for Manny Machado. Andujar showed good reflexes at 3rd last year and the ability to pick it down the line. Hopefully he plays a consistently good defensive 3rd base. He should be a cog in the lineup. SS: Troy Tulowitzki (and Didi Gregorius) — Tulo seems like a fine addition. Hit well in the Spring. Bet you he does well this year. 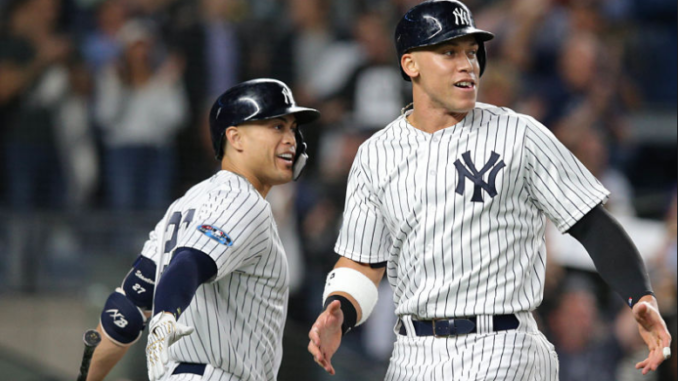 RF: Aaron Judge — A lot of people are predicting an MVP for him this year and we are too. CF: Aaron Hicks — the 2nd best Centerfielder in the American League. Hope he builds on last year. LF: Giancarlo Stanton, Brett Gardner, Frazier — Like most, I am predicting a monster year for Stanton, now that the pressure of the first year with the Yanks is gone. Brett Gardner should play like Brett Gardner. He’s 35; still a decent enough age for him to contribute well. Will be interesting to see what the red head Clint Frazier can put up. DH: Luke Voit — Expect him to pick up where he left off last year. He can hit hit hit. INF: DJ LeMahieu, He’s only 30. He’s won a batting title in 2016. He put up big numbers, albiet playing home games in Colorado. He can pick it in the field. Seems like a terrific addition. Assume he can provide even better hitting than Luke Walker did last year and pick it at 2nd base. OF: Mike Tauchman, Jacoby Ellsbury — Not sure if Yanks can Still get the insurance company to pick up most of Ellsbury’s contract this year. You have to figure at some point the insurance company balks. Will also be interesting to see if Trachman is another Voit. P: Luis Severino — Not expecting a lot from Severino this year. Anything he gives the Yankees will be a plus. Based on the second half of last year, the horrible start against Boston in the playoffs, and his rotator cuff soreness this Spring, I expect him to be out most of the year. P: Masahiro Tanaka — Expecting good things from Tanaka. He’s a steady ace. P: J.A. Happ — Pitched well for Yanks down the stretch. Another nice pitcher to have in your top 3 slots of the rotation. P: CC Sabathia — reminds me of John Wayne in True Grit. He’s announced this will be his last season. Hoping he can go for 10 or 12 wins. P: Luis Cessa — I like Cessa. He pitched well for the Yanks his first year up, and then did not look good last year. This spring he’s looked like the Cessa who first came up for the team. I hope he does well. P: Domingo German — Has terrific stuff. A losing record last year but that was last year. Yanks have confidence he can be a good starter. We’ll see. The Ballpen: Yankees have a very strong ballpen with Aroldis Chapman, Adam Ottavino, Dellin Betances, Zack Britton, Chad Green, Stephen Tarpley, Ben Heller, Jonathan Holder, and Tommy Kahnle. There’s really nothing to say about that list of names except it’s the best ballpen in baseball. It will be up to the manager Aaron Boone to manage it correctly. There were some Yankee fans who felt he did a poor job of it last year.